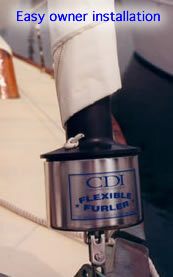 Designed For Cruising - Many production boat builders use CDI as the factory installed furling option. Our best seller! A patented one piece plastic luff extrusion. No joints that will bend or break when raising or lowering the mast. VALUE -CDI units are priced well below manycompetitors so you can add furling and reefing convenience to your boat without spending a lot. Slips over most existing headstays without cutting it. One piece urethane furling drums that can withstand much abuse. 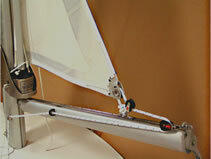 An internal halyard eliminates the need for halyard swivels or pennants. 9 out of 10 Trailer Sailors choose CDI! Which CDI Furler is right for your boat? The correct size depends on; length of headstay, size of wire, turnbuckle screw and the sail area. *Turnbuckle sizes refer to the maximum diameter of the screw that can pass through the foil for installation. The Ball Bearing upgrade adds the easiest possible furling. Furlers come complete with foil & drum ready for installation. Lead Block and line kit may be purchased sepa-rately below. This simple kit includes one clamp on pulpit mount ball bearing fairlead, intermediate railmount fairleads with stainless steel inserts, one deck mounted fairlead and a deck cleat. Also includes the furling line and all necessary screws and hardware. This kit is compatible withmost boats using CDl Units and saves money over buying the individual components.